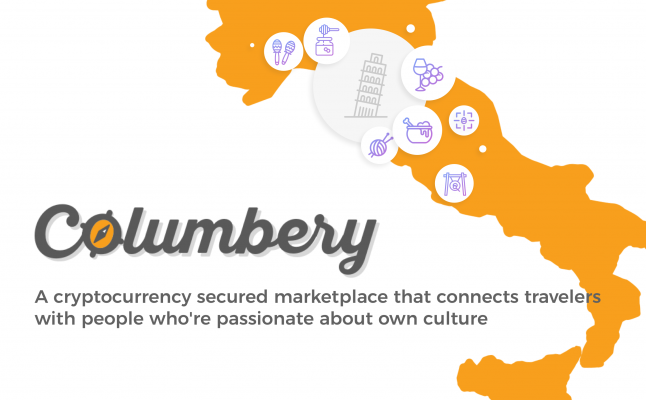 Columbery it is a platform, which unites AI & Blockchain for connecting travelers and businesses. It helps to transform even most unpopular places into smart by using cryptopaying, which promotes local SME. Paying for services is provided with universal currency, which user can mine by adding new places to their program. According to research of Oxford Economics, travel market reached 5,29 trillions dollars in 2017 and it will get bigger in next years. Columbery earns money by promoting SME between travellers. Companies pay only for real customer. Corporations make money by using user­generated data. Users, though, never get paid for sharing it. With current pay_per_click ads model, hackers steal $5M per day by simulating clicks and drastically draining marketing budgets. Tourist centers are overcrowded, culture in regions is fading. Traveller discovers businesses and earns tokens while businesses place free advertisements (coupons), Columbery processes with A.I. data and traveller gets personalized chices and spends tokens. Columbery earns money by promoting businesses between travellers.